The first of Neil Cross's two scripts for the series, but the second to be transmitted, Hide finds the writer in several familiar territories at once. In an SFX interview, Cross discussed the influence of Nigel Kneale's work on the episode, particularly the Quatermass stories and a Christmas ghost story, the legendary television play The Stone Tape (BBC, 25/12/1972). In fact, Hide was supposed to feature an on-screen meeting between Professor Bernard Quatermass and the Doctor, bringing to fruition a slow osmosis between these two post-war British science fiction worlds which began, for Doctor Who, in the Quatermass-influenced Season Seven, featuring the Third Doctor's exile to Earth and his fight against all manner of Home Counties invaders. Later, the link continued to be acknowledged and Bernard and his British Rocket Group also got on screen mentions in Remembrance of the Daleks (1988) and 2005's The Christmas Invasion. Rights issues seem to have scuppered Cross's ambitions to properly bring these two cornerstones of British television science fiction together. Though Kneale would hardly thank you for labelling Quatermass as science fiction and also held a rather dim view of Doctor Who itself, accusing it of frightening children with its intention to 'bomb the tinies with insinuations of doom and terror', in Hide, if you'll forgive the pun, the spirit of Kneale lives on. Hide is an engaging variant on his own themes, particularly in The Stone Tape and Quatermass and the Pit (BBC, 1958-9), a heady mix of ancient, primeval forces colliding with a scientific rationalist approach to index and understand them. The Stone Tape, about a group of research scientists who discover that the stones of a haunted mansion are a recording medium for past events, was inspired by Kneale's visit to the BBC's R&D department as Kingswood Warren and his 1952 radio play You Must Listen in which a telephone engineer, installing a new telephone in a solicitor's office, finds the line has preserved the last conversation of a woman who committed suicide. Cross has also previously dabbled in the ghost story genre, adapting M.R. James' 'Oh, Whistle and I'll Come to You, My Lad' for BBC4's revival of the classic television Ghost Stories for Christmas in 2010. He certainly annoyed many James purists by transforming the original tale from one about rationalist and scientific hubris upsetting or disturbing an ancient order to a story about an astronomer's attempt to deal with his wife's descent into senile dementia and her attempts to communicate with him beyond the limits of her physical body. His redefinition of the story as an expression of a love and fidelity between two people that endures outside of the merely material, as a spiritual force, is worth bearing in mind when we look at the ideas in Hide. 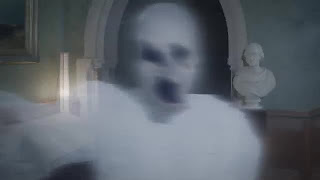 In these days of reality TV shows like Most Haunted (Living 2002-13) and the Paranormal Activity (2007-13) film franchise, the ghostly and the Gothic have become mainstream to the point that found footage, mock documentary and shooting in infrared or full spectrum has now become the predominant visual aesthetic to contextualise evidence of the extraordinary occurring within the ordinary. Yet, they too can tell us a fair amount about the secularisation of our society as parascience is trotted out as entertainment and the metaphysical realm is treated as actuality, making the supernatural seem natural. 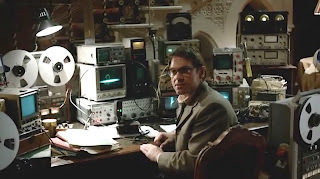 Fortunately, Hide is as far away from Yvette Fielding as you can get and Cross's use of the 1974 setting, highlighted in the ghost hunting equipment of reel to reel tape decks and racks of oscilloscopes and the various items of interior bric-a-brac decorating the set, determinedly places the story within the traditional ghost story and haunted house tropes of a bygone era. These are familiar to us from such classic fare as The Haunting (1963) in which a parapsychologist enlists the help of a psychic and a clairvoyant to prove the existence of ghosts, The Legend of Hell House (1973) where a physicist and two mediums set out to investigate the electromagnetic nature of life after death or The Entity (1983) and its parapsychologists studying the violent poltergeist attacks on a single mother. The Doctor's rescue of the castaway time traveller from an adjoining pocket universe via rope and pulley also reminded me of the similar journey undertaken to rescue Carol Ann in Poltergeist (1982). 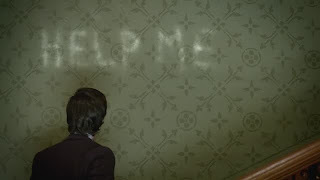 Hide is therefore perhaps a deliberate return to an era where we had yet to see the complete commodification of the supernatural by the likes of Derek Acorah, with his best-selling tips for ghost hunting, and it focuses very firmly on the 'surplus repression' of its main characters. 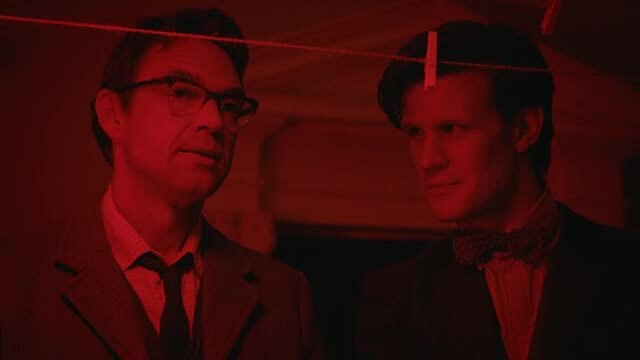 Hide introduces us then to Professor Alec Palmer (Dougray Scott) and his empathic psychic partner Emma Grayling (Jessica Raine - soon to be seen as Verity Lambert in Mark Gatiss's An Adventure in Space and Time) who have taken up residence in Caliburn House in order to investigate the ancient haunting of the Caliburn Ghast, a 'lonely' female phantom. Palmer's 'ferrite suppressors and RF chokes' used to obliterate stray signals during their electronic surveillance of the phenomenon are clearly analogous to the unresolved sexual tension between the Professor and Emma, a relationship which both would like to take beyond the merely professional. Scott and Raine make an immediate impact, are excellent throughout the episode and bring a great deal of emotional intelligence to the script. Cross manages to weave this into the Doctor's wry opening observation about her role as 'companion' to Palmer which she corrects to 'assistant'. 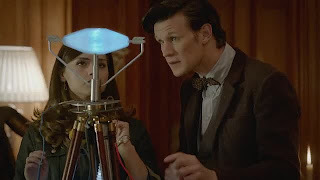 In one fell swoop we have the potted historical context of how the Doctor's friends have evolved from 'assistant' to 'companion' in the last half century and how the 'non objective equipment', the psychic woman as adjunct to investigative science, has become the 'Woman Twice Dead' who chatters on about snog-boxes. She seems an appropriately powerful and powerless individual, as in-between as her ghostly counterpart trapped between universes and the unseen creatures separated from each other. Each duo in turn mirrors the other - the Doctor and Clara are the analog of Alec Palmer and Emma as much as the withdrawn, repressed ghost hunters are mirrored by the estranged crooked alien creatures. 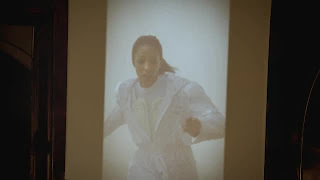 Her connection to lost time traveller Hila Tacorian (Kemi-Bo Jacobs) is not just via an instinctual urge to protect and recover a member of her own bloodline, the drive that sees a parent protect a child, but it is also a reflection of how both women are examples of the 'female Gothic' - Emma as the repressed psychic trapped in the decaying remains of a haunted house and Hila, her great-great-great-great-great granddaughter, stranded in a misty, fairy tale forest. Both are struggling to be free of their constraints, to seek a return to the sphere of the normal world and regain their subjectivity. Both environments have turned hostile and resound with all the traditional Gothic trappings - thunder and lightning, candlelight, mist, shadows and unearthly noises. Alec Palmer is, it seems, a former Major, a military intelligence officer with a reputation. 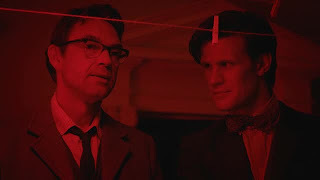 The Doctor is something of a fan of this 'member of the Baker Street Irregulars, the ministry of ungentlemanly warfare' and now a psychologist turned ghost hunter. As we later discover, Palmer is also repressing most of his true feelings behind this rationalist facade, indulging himself, as every paranormal investigator does in the paraphernalia required for the task. He not only surrounds himself with flickering scientific devices but he also delves into the poetry of the Saxons, parish folk tales and anecdotes about tins of ham to track down the Witch of the Well, much like the mythology of Hob was uncovered in Kneale's Quatermass and the Pit. It's also interesting to note how the descriptive, folkloric Witch of the Well is reconfigured as the space-time wormhole containing the lost time traveller Hila. Myth seemingly becomes science. That Alec lies to Emma about his past and his true feelings makes us think of the Doctor and the accompanying warning from River Song, 'the Doctor lies'. Emma believes Palmer spent the war as a POW but the Doctor assures her 'that's a lie told by a very brave man involved in very secret operations.' 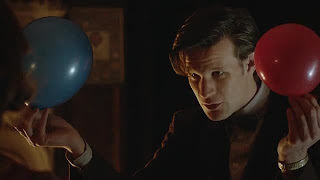 Could this be something the Doctor is unconsciously applying to himself? 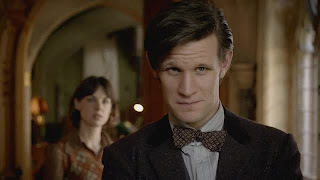 Later, as the Doctor and Clara explore the heart of the house, Alec also aligns himself with the Doctor when Emma questions the Time Lord's ministry connections. He describes the Doctor as 'capricious, brilliant' but is interrupted, very pointedly by Emma's 'deceitful', before continuing with 'he's a liar but you know that's often the way that it is when someone's seen a thing or two. Experience makes liars of us all. We lie about who we are, about what we've done,' and is then again interrupted by her response of 'and how we feel?' Not only is Alec talking about his own deception, more of which we learn of in the later scene in the darkroom with the Doctor, but he's also being accused of his subterfuge and his suppressed feelings by the woman who loves him. 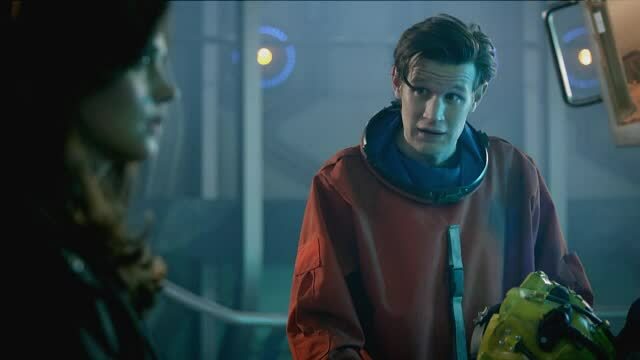 Even the Doctor accuses Clara of 'pants on fire' when she pretends she's not scared. 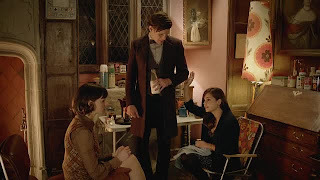 It's a good scene which marks out the theme about deception in the episode, of things not quite being as they should, of the shifts in narrative, and it is matched later by a set of two-handers as Clara chats with Emma over whisky ('the eleventh most disgusting thing ever invented') and the Doctor delves into Alec's past in the darkroom. These scenes develop the idea that this is no longer a ghost story but a love story about Emma and Alec, their unconscious response to Hila's plight and the crooked man trying to find his crooked partner, as a narrative frame surrounding the Doctor's real intention to question Emma about the mysterious Clara. 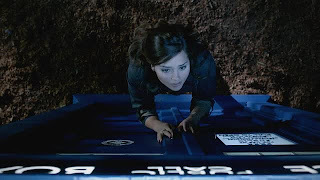 We also have another instance of Clara's relationship with the TARDIS. 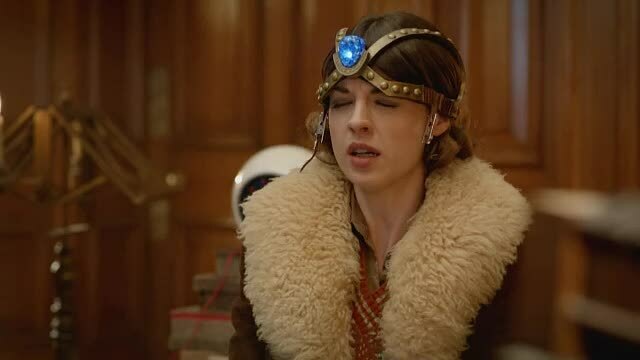 Clara is once more convinced the ship doesn't like her and this continues to suggest she is some sort of anomalous temporal presence, dangerous enough for the ship to be wary of her and act like a 'grumpy old cow'. Pointedly, Clara still does not have her own key which in the past has always been a signifier and acceptance of true companion status. Why is Clara constantly being locked out of the TARDIS? 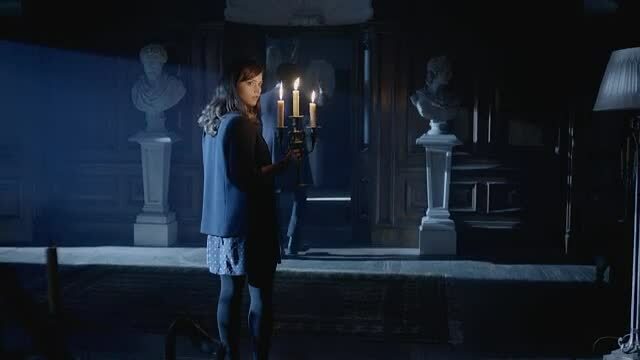 This leads us into a sequence where Clara begins to understand the Doctor's relationship to time, a theme dovetailing cleverly with the central narrative about the ghostly, dead and alive, indecipherable aspects of Alec, Emma and Hila. She witnesses by proxy the birth of the Earth, on a hot Tuesday six billion years in the past, and its demise within a short span of minutes and is troubled by the Doctor's ease with her own sense of mortality. 'So I am a ghost? To you I am a ghost. 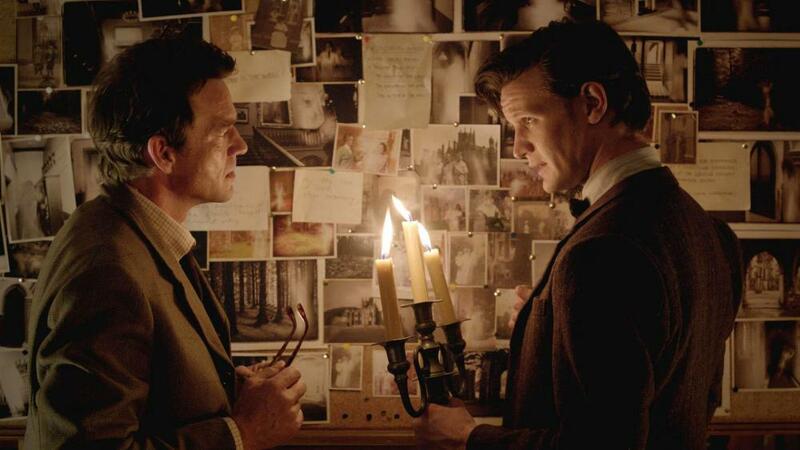 We're all ghosts to you,' she concludes, hitting on that thorny issue of the curse of immortality and the Doctor witnessing the births and deaths of his many friends. After considering what she and the rest humanity are worth to him, he remarks, 'you are the only mystery worth solving.' Judging by the Doctor's affection for Earth, this could be the great story of humanity's triumph and survival as much as a personal observation of the strange woman in front of him, one who has already died in the past and the future. Their return to Caliburn House in 1974 ushers in the concluding half of the episode, where on the surface the mystery of the Witch of the Well is transformed into a story about pioneering time traveller Hila Tacorian stranded in a rapidly diminishing pocket universe. 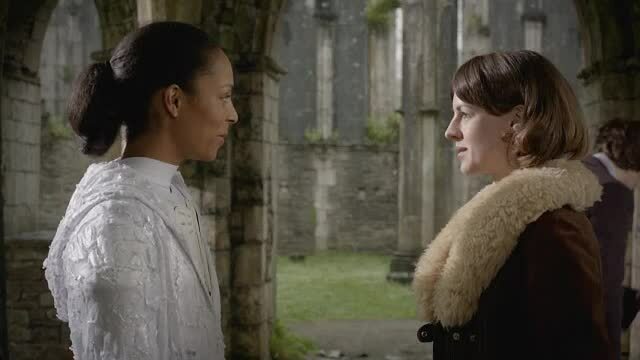 However, after a despondent Clara considers she has seen how 'everything ends' Emma reassures her that not everything ends, her belief 'not love... not always' being a metaphor for the paranormal afterlife she and Alec are keen to prove, their own unrequited love and the unbroken connection with a future descendant. It's an edict the Doctor repeats at the end of the episode when Hila is reunited 'blood to blood' with Emma and Alec. Hila is also given flesh, her tormented ghostly form in 1974 gaining solid form in a series of photographs the Doctor has taken every three million years. The illusory materiality of the spectre becomes a cultural memory, a representation of the return of the not-yet-dead and the Doctor's photography of Hila suggests both her presence and absence, loss and return and a figure both in and out of history, dead and alive. A bit like Clara, perhaps? 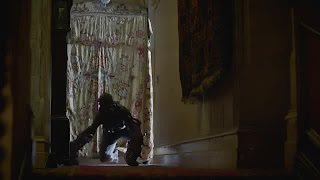 These glimpses of 'lost soul' Hila also visually parallel the brief moments where we have seen another presence in the House, the quick, corner of the eye acknowledgement of the crooked creature. In this case, Hide is as much about seeing and knowing. Merely a call for help from another dimension, the Doctor explains Hila's plight in the pocket universe through a useful demonstration with balloons and the plan to rescue her by using Emma's psychic abilities to guide her, as a lantern in the dark, back into the land of the living. It's also appropriate, at such a moment of revelation, that Emma and Alec also tentatively get the measure of their love for one another. Gone are the days when a BBC minion would check these things it seems, but try and accept the mispronunciation of Metebelis (that's Meh-ta-beee-lis) Three and simply revel in the reappearance of the fabled blue crystals from the blue planet in the Acteon Galaxy. 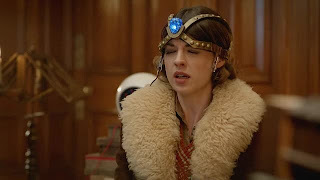 With one strapped to her head, Emma provides a psychic conduit to the pocket universe along with an almost ectoplasmic link to a sub-set of the Eye of Harmony (which revives all those questions about what the Eye is and why an aspect of it is inside the TARDIS) to enable the Doctor to rescue Hila. Both are shaped like an eye which may symbolise the 'third eye' of Eastern and Western spiritual traditions, the gate that leads into inner realms and spaces of higher consciousness, often associated with the seer's use of visions, clairvoyance, precognition, and out-of-body experiences. The aperture Emma and the Doctor open is also the Well, a space of renewal, rebirth and literally of baptism as Hila travels from near death to life. 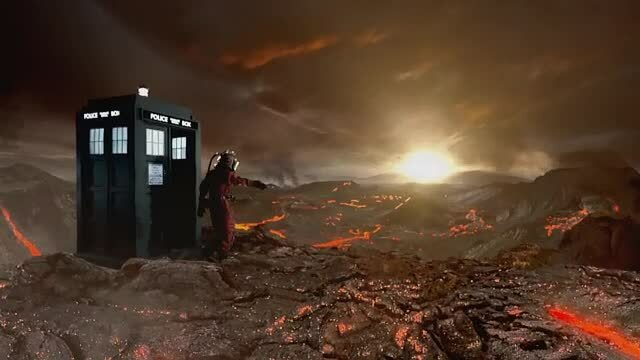 The Doctor's journey is from the conscious world into a primordial, subconscious nightmare where there are glimpses of something unearthly in pursuit. 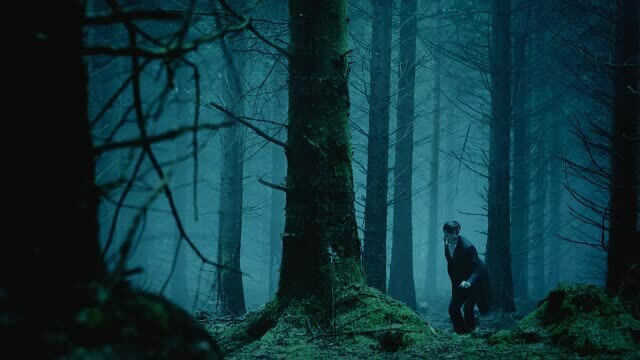 It's a realm where even the Doctor is afraid of 'the bogey man under the bed seeking whom you may devour' (a perennial Moffat theme) and the sequence of him alone in the forest as the TARDIS cloister bell strikes ominously is very expressive. The removal of his bow tie, as a token of his disconcerting fear and crisis, is a rather good touch. Director Jamie Payne really excels in keeping the monstrous creature just out of sight, an ambiguous figure in mist or in shadow, seen only in rapid cuts and camera moves. The sound effects are also responsible for suggesting this horror, the crooked creature's strange creaky, scrabbling noises joining a cacophony of banging, screams, wind and thunder permeating the episode. 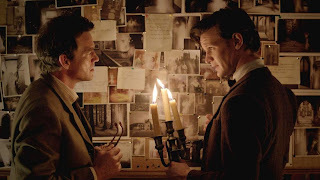 The interiors used in the episode are stunning and were provided by a National Trust property, Tyntesfield House, and again cinematographer Mike Southon effectively concocts a densely shadowed environment illuminated by flickering candlelight, bathing rooms in cold blues and warm browns. His lighting in the forest is evocative too and overall the imagery, editing and sound provide a text book use of optical and aural point of view which connects viewers to the experiences of the characters. 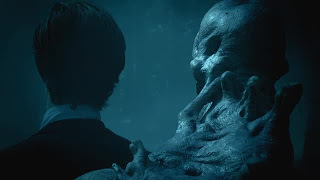 Horror, threat and jeopardy become renewal and reconciliation, which often happens in the current era of Doctor Who, and the bizarre, crooked creature is revealed to be simply another 'lost soul' as eager to escape the collapsing echo universe as Hila and the Doctor. Mind you, I'm not entirely convinced why a creature, which only wants help to get back to its partner, would skulk in a forest cackling with maniacal laughter, trying to put the wind up people. Funny way of asking for a lift but then 'every lonely monster needs a companion' says the Doctor. Or is he referring to himself there?